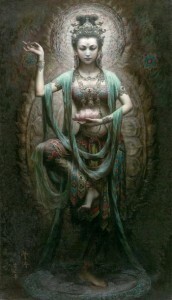 Kwan Yin is a Beloved Divine Mother of Compassion and Mercy, a very powerful Being of Light. She demonstrates the path of the Bodhisattva and is here to help us walk the Way to Being Below all that we are Above. She brings us the flame of mercy, forgiveness and compassion for Life. 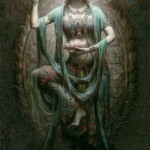 As you connect with Kwan Yin through her Mantras and Decrees, you will find a Being of Great Compassion and Light who will help you find the strength within yourself to forgive, love and know your Self as the Most Beloved!Kwan Yin is a Great Light to this planet and plan, and she is manifesting her Presence within us right NOW! : )~ Ride the waves of Mercy and find yourself transported to realms of Pure Being, Pure Light, of Divine Awareness. Kwan Yin takes you on her dragon of Light and guides the Way.Kwan Yin has a retreat in a cave in the east – in this cave you will find a lake that is stillness. If you were to drop a large rock into this lake, it would gently sink to the bottom, and yet there would be no ripples. We are here to manifest this stillness and the waters of the Mother Kwan Yin will help guide the Way to being one with her beautiful lake of stillness within . This is a brief intro, more will be coming about Kwan Yin and how to gain your own inner connection to divine compassion’s flame soon! :~ ) We also encourage you to share your experiences with Kwan Yin so that others may know the True nature of this Beautiful Divine Mother Bodhisattva.